The month of Shravan is extremely special for all the ShraddhavansIt is considered a holy month that initiates the festivals and Utsavs full of devotion. Shraddhavans actively participate in the Mahadurgeshwar Prapatti Poojan, the month-long recitation of Ghorkashtodharan Stotra and also the Ashwattha Maruti Poojan. 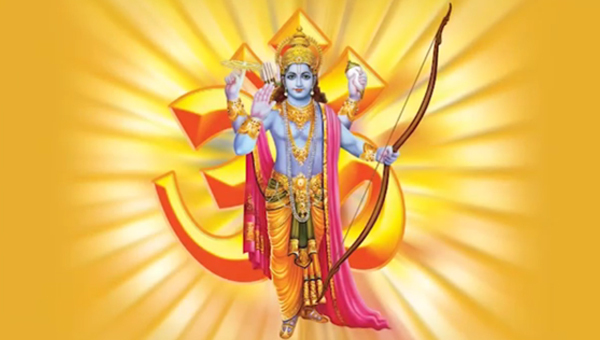 The month following Shravan is Bhadrapad. The much-awaited event in this month is the arrival of Ganapati Bappa in our homes. This festival, of Ganesh Utsav, is celebrated on the fourth day of Bhadrapad. The joy of Bappa’s arrival is boundless. 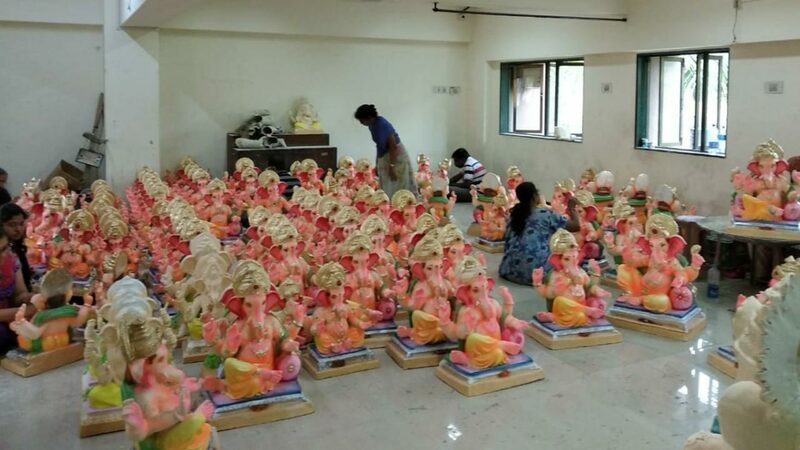 Many of the Shraddhavanshave already booked their Eco-Friendly Ganesh Idols to avoid the last minute rush. The concept of environmental friendly Ganesh was initiated in the year 2004 by Shree Aniruddha Upasana Foundation and Shree Aniruddha Aadesh Pathak, under the guidance of Sadguru Shree Aniruddha Bapu. This concept was introduced to protect the environment and keep the glory and sanctity of this Utsav intact. 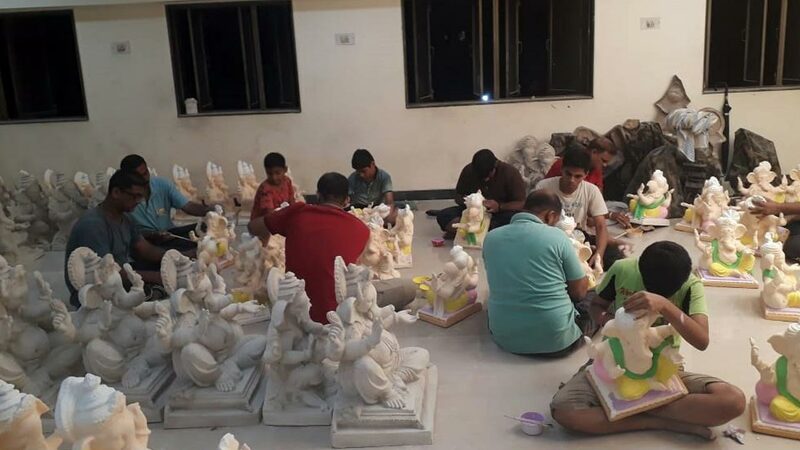 The traditional way of making the Ganesh idols was using natural clay. However, for last many years Plaster of Paris (PoP) is widely used due to its cost-effectiveness. However, this material, basically Calcium sulphate hemihydrate derived from gypsum, is not biodegradable and releases toxic chemicals once immersed in water. Moreover, due to the use of synthetic colours for dyes the idols also release mercury, cadmium, arsenic, lead and carbon on immersion. As all these materials do not allow the Ganesh idols to dissolve completely in water, they pose major environmental hazards which include water pollution and harmful effects on the marine life. 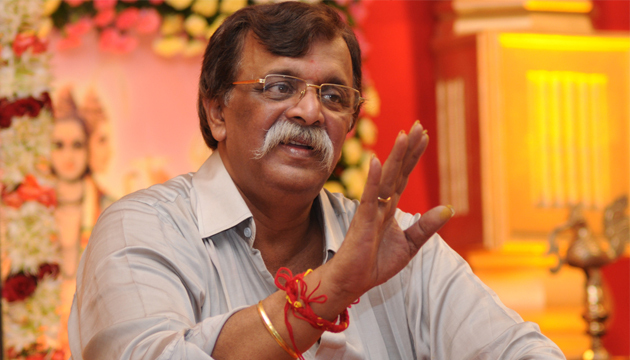 Sadguru Shree Aniruddha thus initiated the Eco-Friendly Ganesh idols to overcome this problem. These eco-friendly idols are created out of the paper pulp made from the Raamnam notebooks which are used by the Shraddhavans to write the name of Lord Rama and other divine names. The pages in notebooks are made wet with water and converted into paper pulp. This pulp is mixed with other natural materials. The pulp is put in a mould to obtain the required shaped and is later coloured using natural dyes. Our organization had the opportunity to patent this novel method of producing an idol, but we did not do so. Rather we kept this concept open to all to help spread awareness about keeping our environment safe. The response to the project has been overwhelming over the years. 335 idols were produced in the year 2005, the number of which has now increased to a production of 7000 idols annually. 6500 idols were installed in 2017 across households. These idols are not only welcomed by our Shraddhavan friends in India but also by those in the USA, Canada, Australia, New Zealand, South Africa, Sri Lanka, UAE, Qatar and Oman. 1. Received a Letter of Appreciation for three consecutive years from 2010 to 2012 from The Municipal Corporation of Greater Mumbai under its ‘Go Green Campaign’ and ‘Environment-Friendly Ganpati’ initiatives. 2. Awarded the ‘Times Special Green Ganpati Award’ in 2009 by the Maharashtra Pollution Control Board, Mumbai Mirror Association and Times Red Cell. 3. Felicitated in 2008 by the Mayor of Mumbai, Dr. Shubha Raul, at an exhibition organized at the National Institute for Training in Industrial Engineering (NITIE) in Powai. ● AADM Basic Course was conducted at AADM Office, Dadar from 6th August 2018 to 12th August 2018. 20 Shraddhavan Bhaktas attended the Course. ● AADM Basic Course was conducted by Patas Upasana Kendra at SAUK PATAS, Taluka: Daund, Solapur Road, Pune from 6th August 2018 to 12th August 2018. 23 Shraddhavan Bhaktas attended the Course. 26 Shraddhavan Bhaktas attended the Course. ● AADM Basic Course was conducted by Virar – Bolinj Upasana Kendra at Adarsh Vidyalaya Bolinj, Bolinj Sopara Road, Next to Ram Mandir, Bolinj Naka, Bolinj, Virar-(W) from 13th August 2018 to 19th August 2018. 16 Shraddhavan Bhaktas attended the Course. ● AADM Basic Course was conducted by Shivajinagar Upasana Kendra, Pune at Aniruddha Aadesh Pathak, Saraswati Apartment, Shivaji Nagar, Pune – 411005 from 20th August 2018 to 26th August 2018. 28 Shraddhavan Bhaktas attended the Course. ● AADM Basic Course was conducted by Dhayari Upasana Kendra, Pune at Pokale School, Near Moti Bakery, Dhayari Road, Dhayari, Pune- 411041 from 27th August 2018 to 2nd September 2018. 24 Shraddhavan Bhaktas attended the Course. ● At the request from Yogiraj Changdev Maharaj Trust, Puntamba and Rahata Police Station, Aniruddha’s Academy of Disaster Management offered Seva for controlling the crowd on occasion of Kamika Ekadashi at Yogiraj Changdev Maharaj Trust, Puntamba, Rahata, Ahmednagar on 8th August 2018 from 9.00am to 5.00pm. 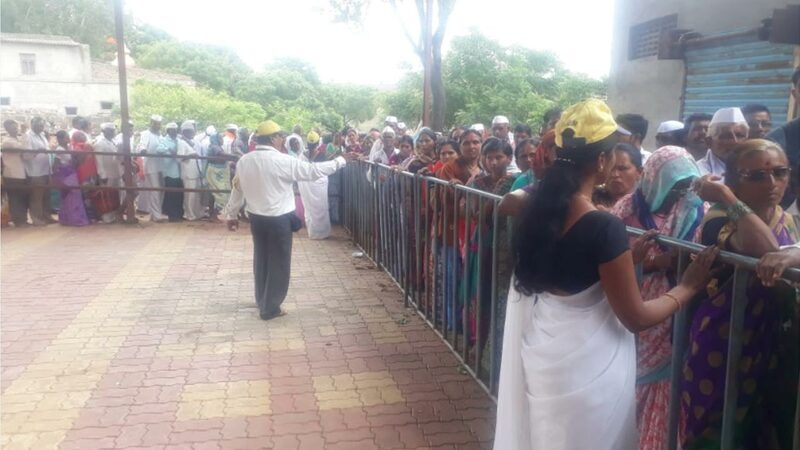 70 (Male – 30 + Female – 40) Disaster Management Volunteers from Rahata, Shrirampur, Kopargaon, Sangamner City, Sangamner – Ganeshnagar, Savedi, Nilwande, Dattanagar and Puntamba Upasana Kendras participated in this seva. The seva was appreciated by Shri. Kadam, Police Inspector, Rahata Police Station and Dr. Dhanjay Dhanwate, Sarpanch Puntamba. ● At the request from Shree Kshetra Nirzaneshwar Devsthan Trust, Kokangaon, Sangamner, Ahmednagar and Sangamner Police Station, AADM had performed seva at Shree Kshetra Nirzaneshwar Mandir, Kokangaon, Sangamner, Ahmednagar on 27th August 2018 (3rd Shravni Somvar). 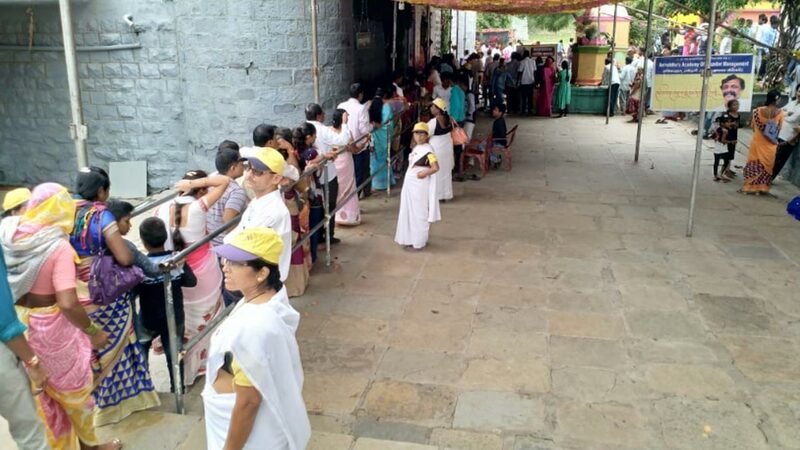 This seva was performed in one Shift i.e. 09.30 am to 05.00 pm in which 60 (Male – 29 & Female- 31) DMVs from Sangamner City, Kopargaon, Nilwande, Akole, Shrirampur, Dahad, Sangamner and Rahata Upasana Kendras participated in Seva. 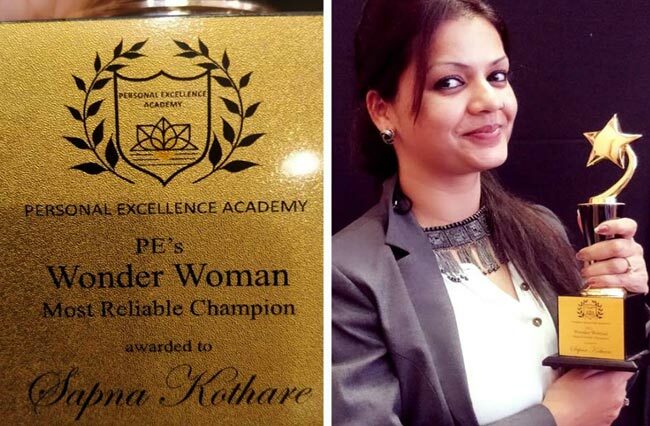 One of our Shraddhavan, Sapna Kothare, employed at Tata Consultancy Services (TCS) won ‘Personal Excellence Award’ as the ‘PE’s WONDER WOMAN’ and the ‘Most Reliable Champion Award’ (Female category). As in the past this year too the festival of Ganesh Chaturthi was celebrated with great rejoicement and fervour. 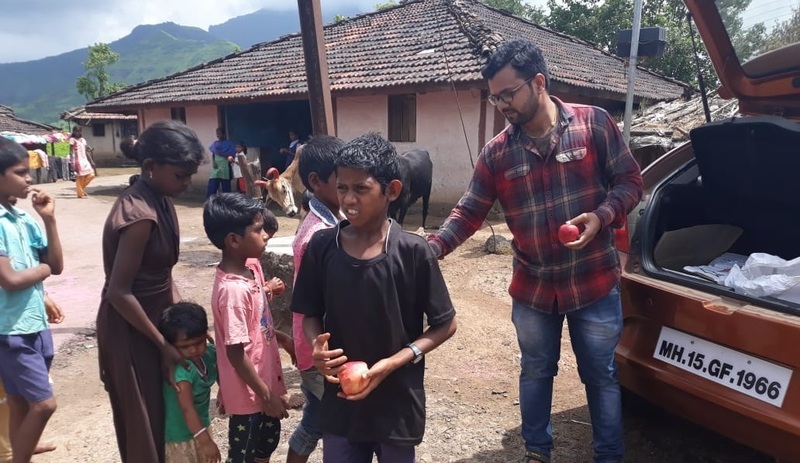 On this auspicious occasion, Shree Aniruddha Upasana Foundation distributed apples free of cost to the villagers of Mokhada, many of whom are malnourished. This philanthropic gesture in is line with the compassion and support offered by the Organisation to the needy from time to time. 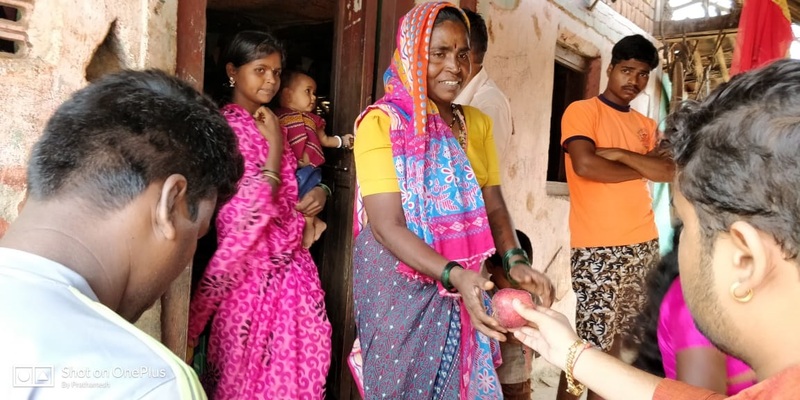 For the last 3 years, Shree Aniruddha Upasana Foundation is also helping the villagers consistently by running a project known as “Charkha Annapurna Yojana” which helps the villagers in earning their livelihood.